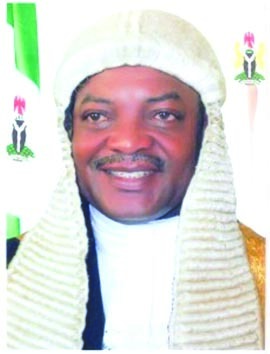 David Iorhemba, the speaker of the Benue House of Assembly as resigned. He tendered his resignation on Thursday citing personal reasons. Reports say Iorhemba handed his resignation letter to the Clerk of the House, Torese Agena, who in-turn handed it to the deputy speaker. The deputy speaker, Stephen Onmeje, read the content of the letter to all the other members. According to the letter, Iorhemba said he took the decision to protect the interest of his family and for other personal reasons, adding that his resignation took effect from November 8, 2012. Onmeje later asked for comments from other members of the House on the issue at hand. Baba Odeh, (PDP-Otukpo/Akpa), said he clearly understood the wordings of the letter, stressing that members did not have any other option than to accept the letter. Odeh went on to move a motion to declare the seat of Speaker vacant and should be filled without delay. The deputy speaker later declared the position of speaker of the Benue State of Assembly vacant after Odeh’s motion was seconded by Benjamin Adanyi (ACN-Makurdi South) who described Iorhemba’s action as honourable. Some people suspected to be thugs, then gained entrance into the chamber of the assembly and chased members out.